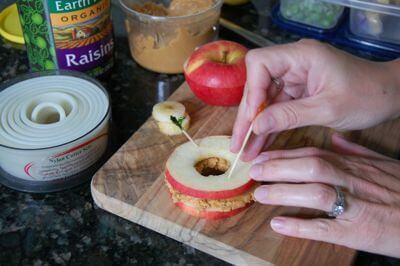 In case you’ve seen these apple sandwiches around, but have no idea how to make them…this is for you! Toothpicks – helps hold sandwich together in a lunchbox that likely gets tossed all around! Before I dive right into the 8 easy steps for making an apple sandwich I’d like to make sure everyone knows about our sponsor, No More To Go…as in No More “To Go” Meals! They are a meal planning service that will email you 5 complete dinner recipes along with a corresponding grocery list every week. All recipes have modifications for gluten free, vegetarian, and kid friendly meals. They are offering 30% off to our readers so when you check out be sure to use the “100Days” coupon code. 1. Cut off the top of the apple and then make the first thin slice (a.k.a. the top of the sandwich). 2. Make another slice, which will become the bottom of the sandwich. 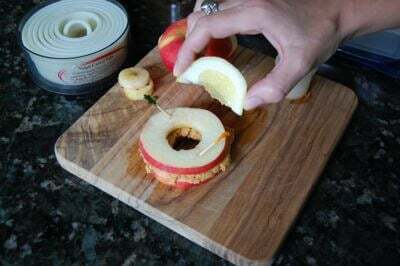 If you started cutting near the top of the apple you can get four slices (2 sandwiches) out of one apple. 4. Add some nut or seed butter (like peanut butter). 5. If desired, add some raisins as well. 6. Put on the top of the sandwich. 8. Squirt with lemon juice to help keep apple from turning brown. You can also mix lemon with a little water so it doesn’t taste so “lemony” or like “cleaner” as my daughter once told me. And voila…there’s lunch! 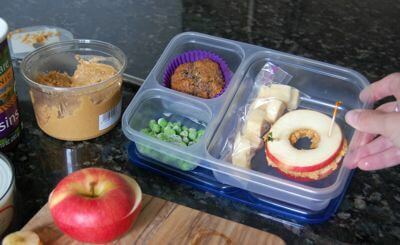 This apple sandwich is paired with a whole-wheat zucchini muffin, frozen peas (that defrost by lunchtime), and cheddar cheese cubes. This is really great. I checked out the sponsors website too, and what a way to get organized! I may not be signing up, but I still think it’s a clever idea for busy moms. Now I know what’s for supper! 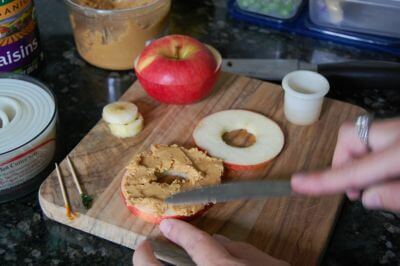 I love apples with peanut butter. I can’t believe I never thought of this. My daughter loves when we make this for lunch. I don’t round cookie cutter small enough, and yes, it’s not nearly as pretty. Might have to purchase one! loved this idea and it is a staple. She also likes it with cream cheese and raisins. Pampered chef or kitchen supply stores have an apple corer that I use to get the entire core out, then i use my mandeline to slice. Mine loves them double decker (three slices with two fillings. I’ve been following your blog for a while now. I’ve decided to try the ten day challenge. I’ve just been so confused lately. Whole grains are good for you…whole grains are the devil. High protein is good for you…high protein will give you a heart attack. I’ve decided to try a combination of both which is pretty much what I see here. Eliminate processed food and eliminate food issues. I like the taste of real food and whole grains so I don’t think this will be very difficult. 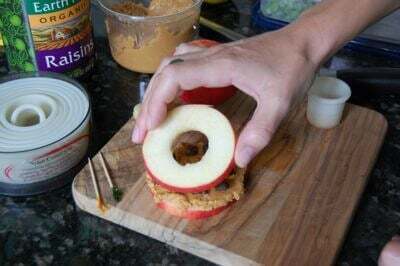 This apple sandwich will be in my lunch this week! Thanks! The moms in our coop thought I was a genius when I packed this for my daughters snack! I know she lives it and it helps her concentrate as opposed to the junk food I see at the stores. Apple sandwiches are so good. We also like to slice them thin and put them on an actual peannut butter sandwich too. Looks divine and perfect for lunch boxes! Thank you for your ideas. This entire lunch looks like something my preschooler would happily eat! Thank you! Your ideas and website are awesome. Where did you get that cute set of circular cookie cutters…they look awesome…one of every size! Thanks for sharing this great idea. I never thought about the cookie cutters. You could even make fun shapes in the middle depending on the cookie cutter design. Fun! OMG! I love this! I read your blog regularly and have never stopped to tell you how much I appreciate your ideas! Your Best Chicken in a Slow Cooker and Slow Cooker Refried beans are now made in regularly at my house. I purchased my Ziploc lunchbox inserts and am so excited about filling my boys’ lunchboxes with more healthy options this school year. I am often happy and proud of how my kids eat but there is still A LOT of room for improvement! This site has helped me a great deal! Gotta get me a small cookie cutter now! Thanks!!! Okay, how do you keep the peanut butter from squishing out when you take a bite? I tried one but it got kind of messy LOL. Perfect after school snack! Thank you!! I had to laugh (nicely) when I read this article. We made these as snacks when I was in Brownies, twenty years ago. My mom was our troop leader and because my older sister has multiple food allergies (they run in the family), we were organic before organic was cool. I do this for my daughter for breakfast with a little granola and honey on it. She loves it. I will have to try it in her lunch too. I never thought of that. Thanks for the great website. Keep the lunch ideas coming……school has begun! Lisa, We make those too, plus Apple Brownie Sandwiches (still plenty healthy enough for a lunch!) http://fresh-you.blogspot.com/2002/01/apple-brownie-sandwich.html We haven’t made either in a while — we’re going to have both for breakfast this morning! Have a great day! PS- funny that my friend Lisa, who introduced me to your website, Lisa Leake, gave me the idea about apple sandwiches — maybe she got it from you! Brilliant!!! I love Pink Lady apples and eat them daily in the summertime. Now I have a new way to enjoy them. Thanks! Every time I make these they are delicious but slidy. Each bite makes the top and bottoms slide or PB to squish out. I end up eating around the edges to keep from dropping PB. Is there a trick (ie pat apple dry with a towel before PB) or just “it’s like that so get used to it”? Thanks! I was having the same problem until I realized that putting a bit of peanut butter on the top slice as well will help it stick to the raisins and thus prevent the sliding. It works very well! I made these with a small apple that fit perfectly in a covered ramekin. I made one with peanut butter and one with cheddar and they were so delicious. I think my coworker was eyeing them from across the table! Thanks for the great idea! I love all your ideas! My mom use to send these to school with me over 20 years ago (cough)! :) But, hers were even easier to make. 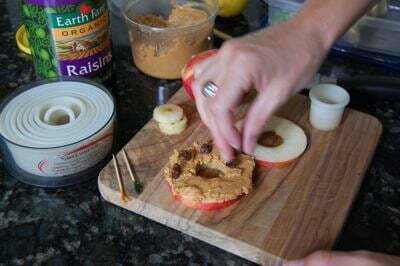 All she did was to core the apple and then layer peanut butter and raisins until the top of the apple which she topped with a little p-butter. Delicious! I make these with my apple slicer-peeler-corer (ya’ know, the thing that you attach the apple, turn the crank and it creates a single spiral apple slice). It makes for a thinner apple slice, but way faster than not having the right coring tools. Great for days I feel like my son has had nothing but grains to eat! To keep apples from browning I use pineapple juice, it keeps them sweeter and still doesn’t let them brown! Love your blog, my son starts kindergarten next week and I want to keep our home nutritional values going while he’s at school. Hopefully if we do cool lunches he won’t trade for all the other junk out there! Wow, this sounds amazing. 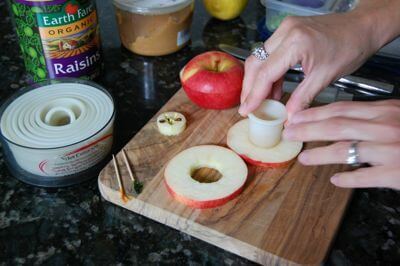 I love some peanut butter and apples but never made a sandwich. Such a great idea when I don’t have bread. Thanks! I just used my Mellon ball tool to take the center out! Super easy! Just pushed down and turned in a circle! LOVE your cute and healthy ideas! I would like to see you ditch the plastic containers and go with something more eco friendly…stainless steel! ;D You’re super awesome..love your blog! I am having a difficult time finding a suitable peanut butter. What kind of peanut butter do you use and where do you get it? Trader Joe’s and Whole Foods make good peanut butter. If you don’t have one near you, regular grocery stores generally have a health food section. I find Woodstock’s brand to be particularly good. Just peanuts (and some salt in the crunchy pnut butter)! I love this! what do you do you usually do with the left over apple? My mom would put apples in salt water to prevent browning. 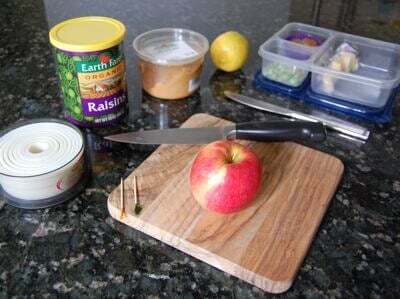 I bet the salty apples would taste good with the sunflower butter! I’ve made these quite a few times now (LOVE them, thank you for the post!). I wanted to share one thing I’ve changed that has made them so much easier for my three year old to eat (and me too ;) ). I also put a smear of peanut butter on the top slice too. Even just a smidge makes the sandwich stick together and I don’t even have to use toothpicks. That’s it! Oh and like I commented on an above post, I do one other thing. I core the apple first (rather than use a cookie cutter after it’s sliced). This way I can use all the apple (generally get about six slices of about the same size thickness shown in the pics above from most apples) which gives me about three sandwiches per apple. Love that circle cookie cutter set! Has anyone used something other than a nut/seed butter? My kids do not like nut/seed butter. Thank you for any suggestions. My son has a possible nut allergy, so we only have sunbutter in the house (but I am the only one who likes it). Nutella, besides containing a lot of sugar, does contain hazelnuts so that wouldn’t be a great choice. Cheddar cheese is awesome with apple and drizzle a little honey to stick it together. The savory of the cheese and sweet of the apple and honey are a great combination. pimento cheese! You could also do hummus or a bean dip if they like either of those. If your making more than one or two, mix about a teaspoon of lemon juice to two cups of water and put that in a bowl with your apple slices. 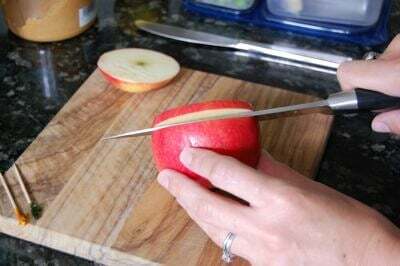 I do this when preparing apples for a fruit tray. I use a Tupperware bowl and lid and gently shake to get all of the fruit covered. If you’re not a fan of citrus or you want to avoid the “cleaner” taste (thought that was cute) I would recommend you get a product called Fruit Fresh. It uses asorbic acid instead of the citric acid that’s in the lemon. Great to know!! I haven’t heard this one before but I will definitely try it. Thank you! Wow, these are simple to make and taste great.. who would of thunk it! Day one on my 10 day challenge. Great job on this one great idea and tasty treats! Forgot to mention I used a twist off wine cap to get my holes. lol worked great. Instead of using lemon to keep your apples fresh, use pineapple juice. Pineapple juice contains the asorbic acid that prevents the apple from turning brown and yet isn’t sour-it even adds an natural touch of sweetness! a file called op. Google Docs in particular is a bit of a lifesaver forr group projects now. I bought the circle cutters. When I used it for the apple it split the side. I was wondering if my slices are too thick or if the apple is too small. They are small apples from my parents orchard. Where do you get the divided containers? We use natural peanut butter. Will it be too runny to make in the morning and eat by lunchtime? I’m just afraid with the peanut butter being so thin it will be runny. I could always make my own peanut butter in the food processor too…just wondering! Hi Abby. It could be a little runny. I often drain much of the oil from the peanut butter that I need to be more sturdy. I keep another container fully intact and that’s the one I use for spreading on sandwiches and crackers. I make turkey Swiss sandwiched with apple slices for potlucks and weekends. Devoured. Apple skidded slices with curried chicken salad, no ghost, are a huge hit.